There is a reason why SPAL high performance axial fans and blowers are the OEM’s choice and fitted to the original piece of kit; because they are designed to function efficiently well beyond scheduled servicing and maintenance. At replacement time, be sure to fit the same robust and reliable product rather than compromise with a lesser brand. Quality always delivers a more cost effective solution over the life of the vehicle. As well as a world renowned heritage in the manufacture, design and R&D of cooling solutions, SPAL fans and blowers come with a market leading 3 year warranty. All fans and blowers in this guide are in stock and available for next day delivery. All single speed blowers come with the standard connector. A link lead is also available with the waterproof OEM connector. Safety Tip: Always check for damaged scroll blades within blowers at the point of service. This can lead to reduced airflow and performance and affect the overall balance of the shaft and motor. Use the diagram below as a reference to measure the dimensions of your blower. This will help you determine which is suitable for you vehicle. McConnel has blazed a trail for quality, innovation and technology since launching the first tractor-mounted hedgecutter back in the 1940s. 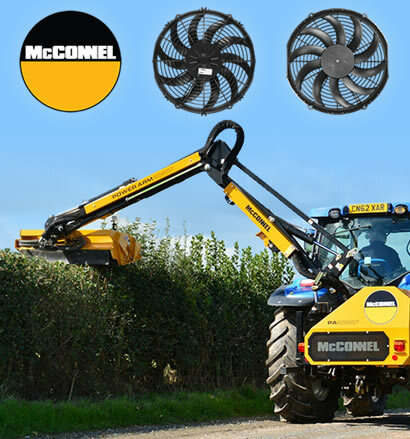 If you own a McConnel Power Arm system then you will want to keep it running to its best ability which includes the cooling system for the machinery, and especially the fan. Operating in a harsh environment both in terms of dust, debris and moisture the cooling fan occasionally needs replacing. We stock a range of fans suitable for McConnel models, click the link below to buy your replacement.